Denny Jump (Bellevue, WA, United States) on 6 March 2012 in Landscape & Rural. HI EVERYONE, I JUST WANTED TO THANK ALL OF YOU FOR YOUR VERY KIND COMMENTS OVER THE WEEKEND, EVEN THOUGH MY PRESENCE IS often "SCARCE" ;-) I REALLY DO APPRECIATE YOUR KINDNESS! I call this, (oddly enough) "Lamp on Right." These sillhouette images were all captured last Saturday evening within 5 minutes of our condo. I posted this particular image because it seems to nicely show the transition that was going on at the time from the yellow gold on the horizon, to the blue higher in the sky - I was loving that ;-) This location is part of a golf course, that also has some open, unused area where one can enjoy views without diturbing the golfers. So I availed myself of the opportunity. Wow, Denny, this is really beautiful capture! I love this, so simple and the colours are beautiful. It looks as if the light is giving the golden glow. It is like a lovely painting. The light -- both natural and man-made -- is the star here. The trees are just witnesses. Beautiful, especially this smooth gradation between blue and yellow. what a wonderful feeling you have captured ... a perfect evening ~ and a perfect title. It's a very beautiful shot and a wonderful composition, Denny - the lamp really works so well here. good eye Denny! I really like this one..very soothing to look at. Damned perfect shot Denny, lovely deep blacks! I love this one. The best so far. Very lovely scene with rolling landscape, detailed silhouetting, and the soft colors in the sky...very well done Denny and a very peaceful scene to visit! Well, here's another thumbs UP comment for you, buddy : this is great! The lamp is both "alien" and natural to the shot, all at once. The light is amazing and it appears that the scene has been lit by this lamp, which makes it very cool. 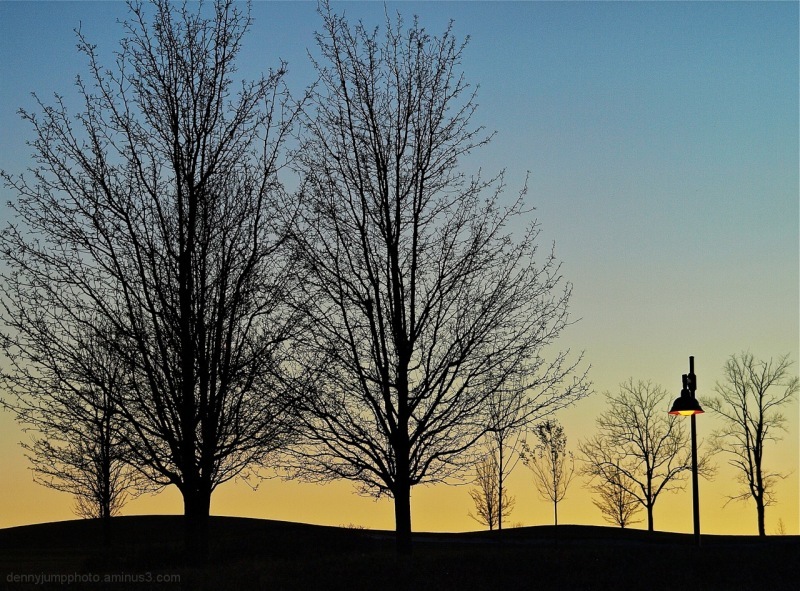 Another nice shot of the trees and the lamp post. Another great composition. I love the rolling hillside captured here, rather than just a flat piece of land. Great silhouettes againat the colorful sky! I love the tree silhouettes and the sky. Beautiful! wonderful composition again, this time with the light as and additional point of interest! beautifully taken! This is a wonderfully beautiful image, Denny. I also find that the lower half of the image makes an equally striking photo, with the focus on all the elements of color and silhouettes. Lovely colors! Nice composition, great silhouettes! i LOVE the gentle curves of the landscape on the horizon! and i like how the light of the lamp comes through in competition with the natural light !! !